Hello, and welcome to my website. Here you’ll be able to find out about me and my career. You’ll also find links to some of my publications and performances. Should you wish to contact me, don’t hesitate to do so via the contact tab of this website. I am an associate professor of music theory at Hunter College of the City University of New York. I’m also on the faculty of CUNY’s Graduate Center, where I have advised five doctoral dissertations through completion. At the grad center, in addition to teaching seminars, I sit on various juries and dissertation committees, and interview and screen prospective doctoral students. At Hunter I am the Director of Graduate Studies in the Music Department. One of the most rewarding facets of my job is student advising—I am always excited to hear of our students’ successes. In addition to teaching undergraduate theory, I also coordinate the Music Theory Fundamentals track at Hunter, which allows me to interact with the wider undergraduate population, and with potential music majors. I began playing cello at the age of nine in my hometown of DeKalb, Illinois. I started an undergraduate degree in physics, but soon switched to my true love, music. My BA in Music is from Stanford University, where I studied cello with Stephen Harrison and music theory and composition with David Rakowski, Ross Bauer, and Leonard Ratner. I then got an MA in cello performance at Queens College (CUNY), where I studied cello with Barbara Mallow and music theory with Carl Schachter. I also have a certificate in cello performance from the St. Petersburg (Russia) Conservatory and a PhD in music theory from Yale University, where I wrote a dissertation on Alexander Scriabin under Allen Forte. Finally, I studied music theory, as a visiting student, with Yuri Kholopov at the Moscow Conservatory. My research specialties include Russian music and music theory, 20th- and 21st-century music, modal theory, critical-race studies, and hiphop and popular music. I have writings published in many top journals—see the research tab of this website for links to some of these articles. I was the founding editor of Gamut, the journal of the Music Theory Society of the Mid-Atlantic, I served as the chair of the Committee on Diversity of the Society for Music Theory from 2007 to 2010, and I currently serve as Vice President of the Music Theory Society of New York State. My recent research focuses on Russian interpretations of modernist composers such as Stravinsky and Webern. Specifically, I work extensively on the modal theories of Sergei Protopopov and Boleslav Yavorsky, whose ideas are widespread in Russia and can be applied to many different types of late-romantic and post-tonal tertian music. Much of this research has entailed archival work in Russia, most significantly at the Glinka Museum of Musical Culture in Moscow. I’ve also generally worked with the voluminous writings of brother and sister Yuri Kholopov and Valentina Kholopova, and I’ve presented their concepts at conferences and in English translation. My most recent writings in the field of popular-music studies examine contemporary Russian rap and hip-hop. As cellist, I perform both classical and contemporary music, playing either my acoustic cellos or my five-string electric cello. I’ve played concerts in North America, Europe, and Asia, under the batons of conductors such as Gustav Meier and Pierre Boulez, in master classes for musicians such as Janos Starker and Glenn Dicterow, and in backup bands for artists such as Johnny Mathis and Stan Getz. 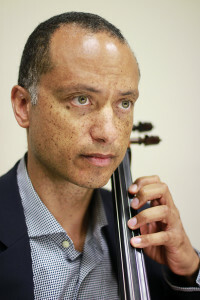 My primary cello teachers were Stephen Harrison, Frederick Zlotkin, Barbara Mallow, and Anatoly Nikitine—see the performance tab of this website for links to some of my performances.